Offering bandwidths up to 160 MHz, the signal generators and analyzers from Rohde & Schwarz are ideal for testing IEEE 802.11ac signals. The WLAN IEEE 802.11ac standard aims to significantly increase data rates, opening up new use cases such as wireless displays with HD quality. To achieve a higher throughput, IEEE 802.11ac has several new features, including a channel bandwidth of up to 160 MHz and 80 + 80 MHz. Further enhancements are 256QAM modulation and multiple input multiple output (MIMO) with up to eight spatial streams. These features enable data rates of up to 870 Mbit/s on a single spatial stream and 6.9 Gbit/s with eight spatial streams. The new signal features place high demands on the performance of WLAN devices in terms of modulation accuracy and adjacent channel leakage. 256QAM modulation, for instance, requires a maximum error vector magnitude (EVM) of –32 dB. Bandwidths of 80 + 80 MHz and 160 MHz present further challenges when designing IEEE 802.11ac devices. Development of IEEE 802.11ac transmitters and receivers requires comprehensive testing, including flexible signal generation and accurate signal analysis. The complex signal configurations and high modulation bandwidths call for state-of-the-art measurement equipment. Rohde & Schwarz signal generators and spectrum analyzers are ideal instruments for in-depth design analysis, precise measurements and fast localization of impairments in TX and RX paths. 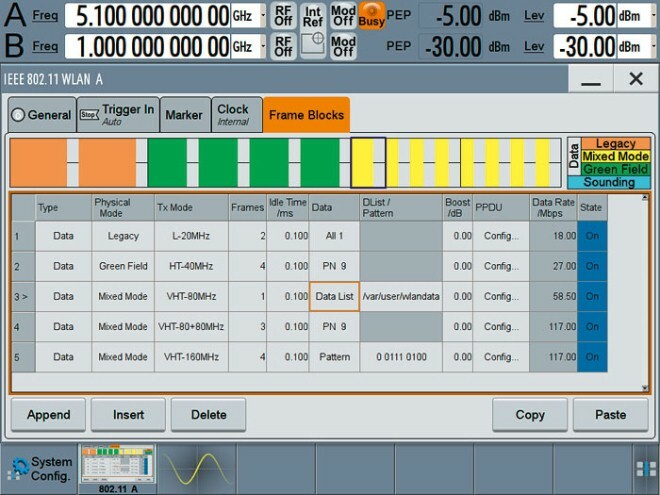 Receiver and component tests require reference signals with very low distortion. Rohde & Schwarz offers two vector signal generators enabling IEEE 802.11ac compliant waveforms generation with 80 + 80 MHz and full 160 MHz bandwidth support. The new R&S®SMW200A is a highend vector signal generator for highest demands on signal quality with an EVM of –49 dB and 0.05 dB frequency response over 160 MHz bandwidth. The R&S®SMBV100A is the first mid-class vector signal generator offering 160 MHz bandwidth in a compact form factor. The generator has very good signal purity with an EVM of –47 dB and a frequency response of 0.2 dB. Both instruments feature a frame block sequencer that allows easy configuration and concurrent signal generation of all major WLAN IEEE 802.11 standards. This is particularly useful when testing DUTs supporting multiple IEEE 802.11 standards. Transmitter tests require spectral measurements such as ACLR and spurious emissions as well as modulation accuracy (e.g. 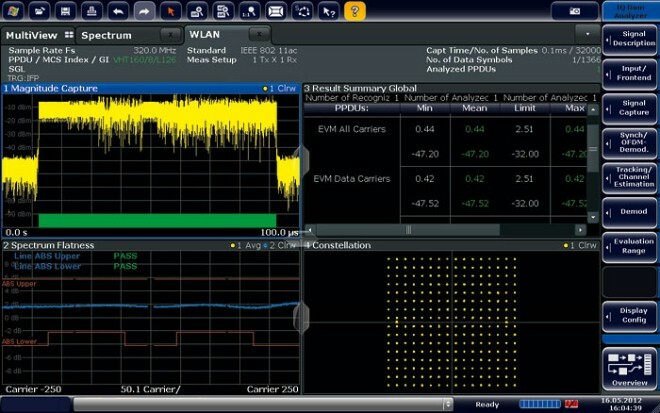 EVM) and analysis of the signal content. 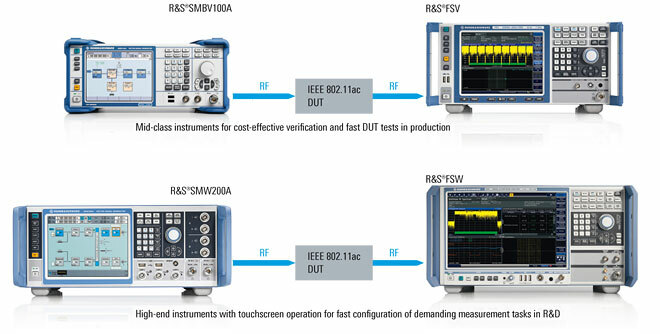 Rohde & Schwarz signal and spectrum analyzers, such as the R&S®FSV and R&S®FSW, offer 160 MHz demodulation bandwidth to perform these tasks easily and accurately. Large touchscreens make signal configuration fast and easy and present comprehensive, clearly arranged measurement results. The outstanding performance of the R&S®FSW high end spectrum analyzer permits the precise signal analysis necessary when characterizing DUTs. For a 160 MHz bandwidth and 256QAM modulation, the residual EVM is as low as –47 dB. The high speed of the spectrum analyzer enables fast measurements during conformance and verification tests. The EVM value of one frame can be acquired in about 35 ms.